The presidential pardon application process can seem confusing and difficult to understand. This simple guide works to address the mystery surrounding how to apply for a presidential pardon. So often when we think of presidential pardons, we recall controversial moments in national politics: President Trump’s pardon of racial profiler Sheriff Joe Arpaio; President Bill Clinton’s pardon of his friend and fundraiser Marc Rich; President George H.W. Bush’s pardon of his close colleague Caspar Weinberger; and, of course President Gerald Ford’s pardon of his predecessor Richard Nixon. However, in most cases presidential pardons do not involve captivating stories of political intrigue or the appearance of unfair favors for friends. Rather, the administration of presidential pardons is a more routine affair. Individuals convicted of federal crimes complete a presidential pardon application, and federal officials review the application. Ultimately, the application lands on the president’s desk for a decision. Because the vast majority of presidential pardon recipients do not merit a front-page headline in the New York Times, it is important to understand the basic mechanics of a presidential pardon application – literally, the “who, what, when, where, and why” of a presidential pardon application. Looking at the presidential pardon process this way easily shows how the use of presidential forgiveness works in practice. Who Can Apply For A Presidential Pardon? "The President . . . shall have Power to grant Reprieves and Pardons for Offences against the United States." Article II, Section 2, Clause 1 of the United States Constitution. Since the power to grant a presidential pardon comes from the U.S. Constitution, a presidential pardon can only be granted for federal convictions. Put differently, the President of the United States only has the ability to provide presidential pardons to people who were convicted in federal court for federal crimes. The presidential pardon power does not apply to convictions for state crimes. Obtaining a pardon for states crimes varies from state to state. But generally speaking, people who want to get a pardon after they have been convicted of state crimes must apply to the governor of the state where they were convicted. The material below applies only to presidential pardons. What Is A Presidential Pardon Application? To start off, a formal presidential pardon application isn't actually called by that name. Instead, the actual application form for a pardon from the U.S. President is called the “Petition for Pardon After Completion of Sentence.” We will simply refer to this as the Application, and remember: this information is specific only to asking for a presidential pardon. Your charitable and community activities. The Application also asks you to explain the reasons why you are seeking a presidential pardon. The short answer is usually that you want to get your life back. The long answer, which you actually write in the Application, may be that you have truly turned your life around since you were convicted and that forgiveness is appropriate in your case. Explaining in detail the reasons why you should receive a presidential pardon is the most important part of the Application and should not be overlooked or rushed. The Application also asks you to provide a number of character references. This means that you need to list a number of people who are willing to vouch for what a good member of society you have been since your release. The people that provide character references should have known you for a significant amount of time, and it always helps if someone can describe how you have changed since the time before your conviction through today. When Should I Submit A Presidential Pardon Application? Presidential pardons, also called "executive clemency," are governed by Department of Justice rules. These rules do not restrict the power of the President to grant pardons, but are generally followed in most cases where someone has submitted a presidential pardon application. The rules governing presidential pardons (executive clemency) require that you must wait at least five years after you were released from confinement before submitting a presidential pardon application. If you were convicted of a crime but not required to serve any time in prison, the five-year waiting period begins to run on the date you were sentenced. The purpose of the waiting period, according to the Department of Justice, is to give a reasonable period of time to demonstrate an ability to lead a responsible, productive, and law-abiding life. This five-year waiting period for ordinary people seeking a pardon is often very different in practice from the most famous instances of presidents granting pardons to their close friends, donors, or even predecessors (like Richard Nixon) well before the five year waiting period was up. What this shows is the basic fact that a president has the power to grant a pardon to anyone at any time. The president can grant a pardon to anyone before they are charged with a crime, after they are indicted, during a criminal trial, before they are sentenced, while they are in jail, or after they are released. As a practical matter, however, if you want to apply for a presidential pardon through the Office of the Pardon Attorney you must wait five years until after the day you were released before submitting an application. Any application submitted before the waiting period has expired typically will not be considered. Where Do I Apply For A Presidential Pardon? The President has the sole authority to grant or deny an application for a presidential pardon. Like every other presidential power, the President has delegated the day-to-day ins-and-outs of evaluating presidential pardon applications to a specific executive office. In this case, the specific office involved is the Office of the Pardon Attorney. The Office of the Pardon Attorney is a part of the U.S. Department of Justice. For over 125 years, the Office of the Pardon Attorney has assisted the President in the exercise of his executive clemency power and the granting of pardons. 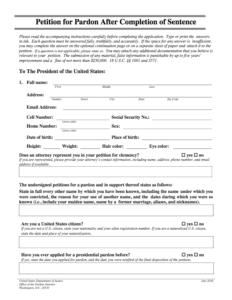 If you want to request a presidential pardon you must submit your application to the Office of the Pardon Attorney. Whenever the Office of the Pardon Attorney receives a presidential pardon application, the Office reviews, investigates, and prepares a recommendation about the application. The recommendation from the Office of the Pardon Attorney is not binding on the President, but the President is extremely unlikely to grant a presidential pardon application that is not suppored by this office. Essentially, the Office of the Pardon Attorney is the gate-keeper who decides if your presidential pardon application will ever make it to the President's desk for signature. Why Ask For Presidential Pardon? A presidential pardon is an official sign of forgiveness, and relieves individuals of disabilities resulting from a conviction. People asking for a pardon usually make a request because they have accepted responsibility for their crime, expressed remorse, and established a record of good conduct since being released from their sentence. People who successfully apply for a pardon are often people who truly demonstrate a change in their lives and who positively contribute to their community. Another reason a person may seek a pardon is to gain back some civil rights taken away as a result of a federal conviction. The right to vote and the right to hold public office are two such rights that could be restored if a presidential pardon is granted. A presidential pardon may also restore your ability to exercise your Second Amendment rights by owning guns, firearms or ammunition. There are other federal benefits which may be restored as well if your presidential pardon application is granted. The presidential pardon application itself is relatively simple and easy to understand. It is impossible to guarantee that anyone in particular will obtain a pardon through a presidential pardon application. The President has complete discretion to grant or deny any presidential pardon application. As mentioned earlier, the Department of Justice has rules (that are not completely binding, but usually followed) which establish when and how a presidential pardon application may be submitted. According to those rules, if you submit a presidential pardon application to the Office of the Pardon Attorney and that application is denied you must wait another two years before submitting a new application for a pardon. Presenting the most persuasive, complete, and compelling presidential pardon application in your specific case is vital to making sure you have the best chance at receiving a presidential pardon. Incomplete or unprofessional pardon applications are extremely unlikely to result in a presidential pardon. More importantly, submitting any presidential pardon application that does not put your absolute best foot forward will probably be denied; meaning you will be forced to wait another two years before you can request a pardon again. Whether a pardon will be granted, of course, depends upon the priorities of the particular U.S. President at the time you apply. But, President Obama’s recent Clemency Initiative resulted in granting clemency to 1,715 people. This program and the continuing work of the Office of the Pardon Attorney gives us hope that clemency is still available for people who have learned from past mistakes and changed their lives for the better. You can find more information about presidential pardon applications and executive clemency in general throughout our website. If you or a loved one is looking for help with a presidential pardon application, please contact Brandon Sample, Esq. by calling 802-444-HELP (4357) for a free consultation, or submit an online request for a free consultation.